I am getting ready for a Homeschool conference in 2 weeks. I am making stuffed Tadeo Turtles which I will be giving instructions for soon. I hope to have a bale of them for the conference. 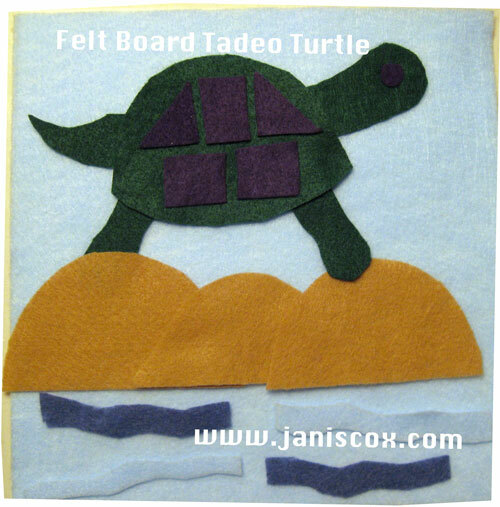 But for today I am going to show you how to make a turtle scene using felt board. You can make any scene you want, then move around the characters and items. But today Tadeo is going to show his story. Cut the felt to match the size of your cardboard. I used the light blue for my background but you can use whatever colour you wish. 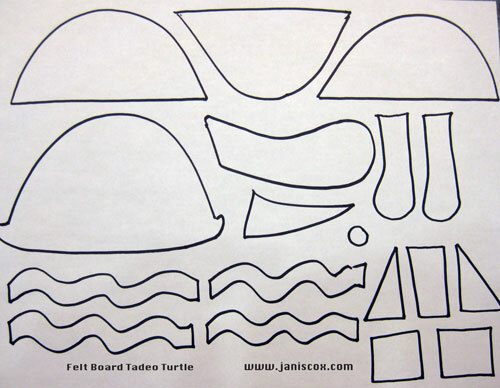 Cut out the other pieces using the PDF file Felt Tadeo Turtle, see below; or draw your own. You could print this PDF onto photo copy (or stock paper for easier handling). Then trace the patterns onto the felt. Cut out the pieces. Glue the shapes to the turtle’s back. Glue the eye to the turtle. You could use a googly eye instead. Leave the other shapes free to move. Now make the scene. You can hide Tadeo behind the rocks, just like in the story. This craft is shown in my book Tadeo Turtle. 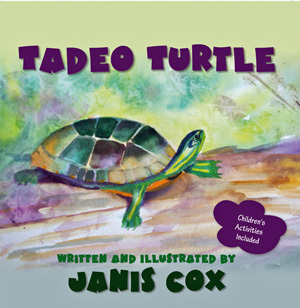 Please check out more on Tadeo’s Page. This entry was posted in Prayer and tagged Crafts on May 10, 2013 by JanisCox. This is SO fun! I love the pattern you shared, too! Thanks for linking to Share It Saturday this week- I’ll be featuring you tomorrow. 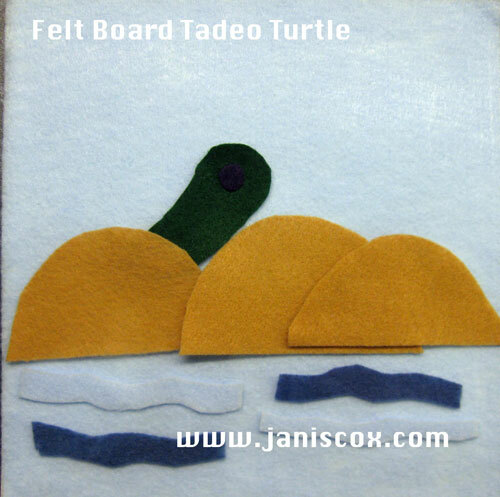 Such a cute felt board turtle!! Thank you for sharing at Sharing Saturday! Super cute! My girls love playing with felt story boards (the few times that they’ve seen one) so this would be a great craft for them. Thanks for sharing the turtle shapes, as I’m terrible at drawing! And thanks for linking up with the Write Mama blog hop. Sometimes it is good to return to “old fashioned” activities. Look at the cute turtle!! Love felt. Thanks for stopping in by my blog. Pinning this too. Thank you so much for commenting. For some reason your response went into my spam. Thanks for the pin. Blessings to you. Thanks so much for your encouragement and enthusiasm.